Music is an important part of your wedding from the ceremony to dinner to your first dance as a married couple. We have asked our DJs what their favorite songs are and which ones they think work best to get people out on the floor and dancing all night long! Get some song ideas from our DJs and see what works best for your special day. “We’re seeing a tremendous choice in every aspect of a wedding. That’s the biggest thing that has happened in weddings. It makes for a very exciting time for brides and grooms. That’s the most exciting part of the wedding,” said DJ Scott Alexander. Alexander said with new music being released every year there are always emerging songs you need to know that are unique and specials to couples. “I love new music so much. It changes every year with new waves of songs,” he said. Alexander said current songs that speak to couples include “Millionaire” by Chris Stapleton and “Speechless” by Dan & Shay. He said favorite first dance songs continue to vary because brides and grooms always have access to new music. He said some common choices include “Unforgettable” by Nat King Cole, which Alexander said is a universally a beautiful love song. “Somewhere over the Rainbow” by Israel Kamakawiwoʻole and “What a Wonderful World” by Louis Armstrong are other good standard choices. DJ Jet (Jesse) said “Come away with me” by Norah Jones is a good choice for a slow first dance song. He said other popular choices include “Can’t Help Falling in Love” by Hailee Steinfeld, “Perfect” by Ed Sheeran, and “You Make it Easy” by Jason Aldean. Jet said these songs do a great job appealing to a large audience. DJ Sosa said some of the favorite first dance songs he commonly plays include “Perfect” by Ed Sheeran, “Holy” by Florida Georgia Line, “Say You Won’t Let Go” by James Arthur and “Can’t Help Falling in Love” by Ingrid Michelson. DJ Scott Alexander said a most common father and bride dance song that is requested is “Butterfly Kisses” by Bob Carlisle. “Daddy’s Little Girl” by T. Carter is one that DJ Jet said people like a lot even though the artist isn’t widely popular. “Daddy’s Little Girl” by The Shires is a country song that DJ Jet said is currently popular for father and bride dances. DJ Sosa said one very commonly requested father and bride song is “Wish” by Rascal Flatts. DJ Scott Alexander said songs like “I Hope You Dance” Lee Ann Womack are popular for mother and groom dances. He said in many cases it is easier to find a song more easily for a father and bride dance than a mother and groom dance. DJ Jet (Jesse) said the favorite mother and groom songs include “A Song For My Son” by Mikki Viereck, “I Hope You Dance” by Lee Ann Womack, and “Humble and Kind” by Tim McGraw. “A Song for Mama” by Boyz to Men is a song that DJ Sosa said is a favorite for the mother and groom dance. Chicken Dance: Is it a Do or a Don’t? DJ Scott Alexander said the chicken dance is a song he rarely plays. “It’s usually when there are children in attendance. I would say that some of those types of songs that used to be absolutely standard at weddings have kind of grown tired. Same with a polka,” Alexander said. He said he plays these types of songs when children are involved, and there is a reason for something fun and silly. DJ Jet said that there is nothing wrong with playing the chicken dance at your wedding. He said it’s one he plays if there is a younger crowd. “That’s one that gets all age groups on the dance floor. It just depends on what kind of crowd you’re dealing with” Jet said. DJ Sosa said that it’s been a long time since he has played the chicken dance at a wedding. He said it only gets requested about 2% of the time, but other songs such as the Cupid Shuffle, Cha-Cha Slide, and the Electric Slide are still played. DJ Scott Alexander said he starts with songs such as “Brown Eyed Girl” by Van Morrison and “Love Shack” by B52s. He also said line dances are a popular choice, and they always work to get people out on the dance floor, but the Electric Slide is not as popular anymore. Alexander said “Celebration” by Kool & The Gang is a song that is overplayed. DJ Jet Best said songs such as “Don’t Stop ‘Til You Get Enough” by Michael Jackson, “Push It” by Salt n’ Pepper, and “Now that We Found Love” by Heavy D & The Boyz are great for getting people moving. He said a song that takes things to the next level is “Gonna Make You Sweat” by C+C Music Factory. He said more modern hits that are popular with crowds include “Timber” by Pitbull, “Starships” by Nikki Minaj and “House Party” by Sam Hunt. DJ Jet said other popular dance songs such as “Hot Hot Hot by Buster Poindexter can get a conga line going. DJ Sosa said to get things started he play popular hits such as “24K Magic” by Bruno Mars or “Uptown Funk” by Mark Ronson ft. Bruno Mars, “Shut up and Dance” by Walk the Moon, “September” by Earth, Wind, and Fire, “Brick House” by The Commodores, and “Do You Love Me” by The Contours. He said he ends every event the same way, with the popular hit “Don’t Stop Believing” by Journey, unless something else is requested. DJ Scott Alexander said there are a handful of slow songs he plays that always work to get couples out on the floor. According to Alexander “At Last” by Etta James is the top song for a slow dance at a wedding. 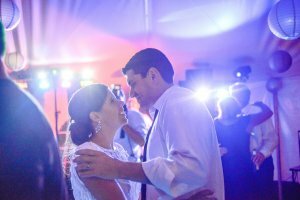 He said songs such as “Bless the Broken Road” by Rascal Flatts, “Unforgettable” by Nat King Cole, “What a Wonderful World” by Louis Armstrong and “All of Me” by John Legend are also great slow dance songs for a wedding. DJ Jet said “Then” by Brad Paisley, “What a Wonderful World Mix” by Kenny G and Louis Armstrong, “All of Me” by John Legend and “To Make You Feel My Love” by Bob Dylan are all great slow dance songs. He said the best slow dance songs depends on the crowd. DJ Sosa said popular slow dance songs at weddings include “Then” by Brad Paisley, “Stay” by Rihanna, “Thinking Out Loud” by Ed Sheeran, and “Marry Me” by Train. Stick with Tradition or Try Something New for Your Special Day! Whether you prefer a more traditional ceremony or are looking for a new and unique way to do things, do what you feel most comfortable with. DJ Scott Alexander said many new brides and groom are moving away from a variety of traditional wedding elements such as the bouquet, garter, and the bridal party dance. “The standard events and the standard songs have been questioned by the new brides and grooms,” said Alexander. With access to so many new songs, don’t be afraid to stray from tradition with your playlist and try something new and unique for your special day! Contact us today to learn more about our DJs and the services they can provide for your special day!